Pets are like members of the family, with some people treating them like their own children. And just as we use products to make our lives easier, there are also materials that can make our pets’ lives easier as they age, recover from medical procedures or just because they deserve them. With the potential uses for foam reaching far beyond humans, The Foam Factory’s inventory of closed-cell foam products can make your pet’s life easier and keep them happier. One product that can benefit a pet, large or small, is The Foam Factory’s pet stairs. Manufactured in three different sizes, these doggy steps have a firm and stable surface that allows a pet to confidently climb up and down from a surface without it caving under their weight. Cat or dog stairs can provide access to areas that were formerly difficult to reach, be it because of the pet’s size, age or health. Even if your pet is perfectly fit, these stairs reduce the potential for injury by eliminating the necessity of running jumps onto surfaces. Being able to get onto a bed or chair slowly also means they won’t slide off the other side from going too fast. Jumping into the car or joining you on the couch will no longer be a challenge for your pets, and you also won’t need to worry about hurting them or yourself picking them up. Made of polystyrene, The Foam Factory’s pet stairs are very light at only a couple pounds, which makes them easy to relocate or bring along in the car for easy in-and-out once you reach your destination. Manufactured in three different heights of 12, 16 and 23 inches, there’s a size that’s right for any pet. 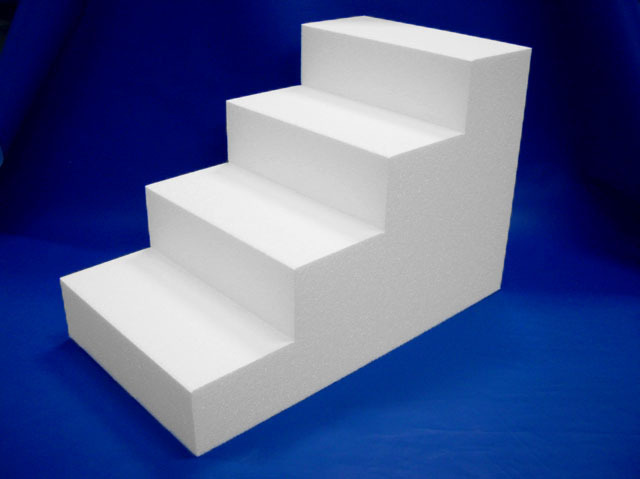 Despite their minimal weight, these steps can support 110 pounds*, and for the largest animals, special orders can be placed for stairs made of higher density polystyrene that can support additional weight. Being that the health, happiness and safety of your pet is the reason you would provide this product to them, it is important that you always make sure your pet’s steps are used on a flat surface and that you stabilize the steps while in use to prevent tipping or falling. To customize their appearance, stair covers can also be ordered in a variety of fabrics and colors, either sewn shut or with a zipper included for easy removal and washing. Cargo liner pads for the back of the vehicle are another product that can make your pets’ lives more enjoyable. In most vehicles, the cargo area where pets travel is made of hard plastic or metal, covered with scratchy carpeting. We ride in luxurious leather or cloth seats and certainly wouldn’t tolerate such an unpleasant surface for ourselves, so why should we make our pets? To make their ride a little easier, as well as protecting the vehicle from scratches or accidents, The Foam Factory offers a custom foam cargo mat for your pet. 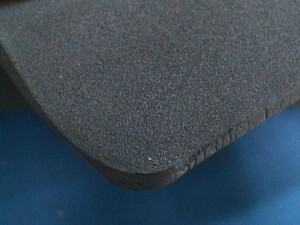 By providing the measurements of your vehicle’s cargo area or specifying the dimensions you desire, The Foam Factory’s computer controlled machinery can cut a neoprene rubber pad to your exact specifications. Neoprene provides a cushioning surface that offers enough grip to keep your pets from sliding and slipping. Available in thicknesses from 1/8 of an inch to 2 inches of solid material, The Foam Factory suggests ¼ inch thickness for comfort that still gives your pet the stability it needs in a moving car. Uncut sheets can also be ordered in full or half sizes and trimmed at home for a simple DIY foam mat. That same neoprene foam padding can also be applied to cage liners, whether placed inside their travel crate, or in a cage they feel comfortable relaxing in at home. Most travel crates come with a molded plastic bottom that’s about as comfortable as you would imagine molded plastic to be. These can also be slippery for pets while traveling, especially since they cannot anticipate the movement of a vehicle. A neoprene crate liner can add a soft but supportive cushion that is waterproof and easy to clean when necessary. By providing more grip than hard plastic, pets gain more traction from a crate mat and when cut to fit snugly, the crate bed won’t slide or bunch like cushioning cloths or pillows can. For added security, small Velcro strips can be added to the mat and crate to always keep it in place while remaining removable for cleaning. Neoprene is also insulating, which means if a cage is placed on a cold laminate or tile floor, the neoprene layer will reduce the transfer of heat away from your pet, keeping them warmer. This makes them excellent for use as a kennel mattress pad, for indoor/outdoor setups with concrete or dirt floors. Litter box mats are another use for foam that is targeted specifically at cats. Placed just outside the entrance to a cat’s litter box, these pads will catch kicked litter as well as reduce the amount of litter tracked from the cat’s paws. They are also valuable if a cat aims outside of its litter box or is unable to make it inside in time. With its soft, waterproof structure, neoprene is, again, practical for these pads, as is closed-cell cross-linked polyethylene (XLPE) foam. Mats can be ordered in thicknesses from 1/8 of an inch to 2 inches, and are firm enough for a cat to feel comfortable walking on while providing enough give with each step to gently help clean out trapped litter from their paws. The flexibility of the material also allows it to be rolled if a substantial amount of litter has been collected, making clean up easy by pouring the litter into the trash or back into the box. These mats can be ordered in any dimensions desired and are also easily cut from their sheet form at home. Another potentially beneficial characteristic of XLPE is its availability in seven different colors for customizing the mat to match its surroundings. As our best friends, pets deserve the most comfort and security we can offer. Particularly important to the happiness of older pets or pets recovering from surgery is minimizing their stress and maximizing their ability to relax. With their line of foam pet products, The Foam Factory makes it easy to keep your pets happy, healthy, wagging and purring. * Pet stairs are not intended for human use. Weight must be applied directly downward to support the 110 pound rating. Outward pressure located on the edges may damage the product.